If you’re like me you don’t spend much time in the Canadian Whisky section at your local liquor store. It’s not that I’m Anti-Canadian it’s just Canadian Whiskey usually lends itself to a lighter flavor profile more suited for mixing cocktails than served neat or on the rocks. That being said this bottle by Collingwood might just change the way you (or I) think about Canadian Whiskey. This bottle is a head turner. While it obviously doesn’t affect the taste, I just can’t get over the amazing package design that went into this bottle. From the logo to the matte black cap and silver seal, you can tell that this bottle was meant to announce that Collingwood was going to be something different, something better than it’s competitors on the shelf. The only flaw on this design is when you take off the cap, you discover a cheap plastic siphon reminiscent of bottom shelf budget whiskey. The bottle does have a wide mouth but I still feel like they overlooked this detail and am hoping the make an update as they continue in order to bring this bottle perfection. 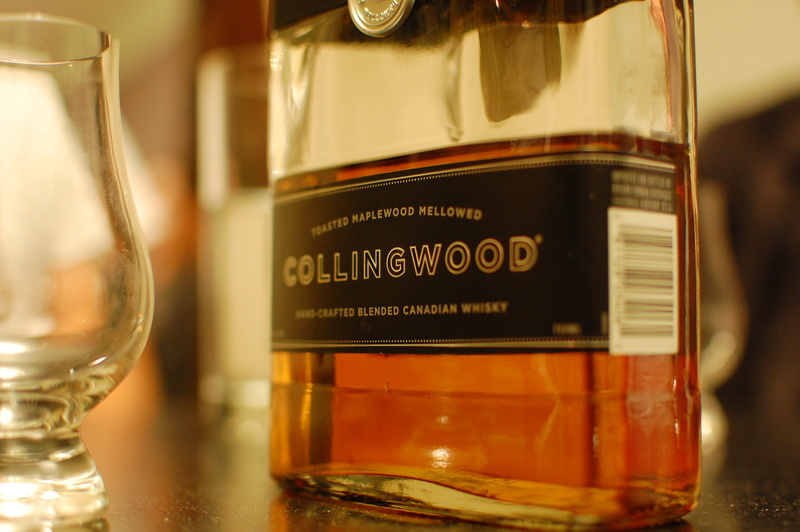 Collingwood is triple distilled using water from Ontario’s Georgian Bay and matured in white oak barrels. Collingwood states that the secret to their success is the extra step of post-blending Sugar Maple Mellowing. This step reduces acidic harshness and allows the whiskey to pick up sweet flavors from the sap (note the wood has been toasted, not charred). The spirit appears to be the only Maplewood mellowed Canadian Whiskey on the market and is definitely worth trying. It’s easy to sip at only 80 Proof as well as being easy on the wallet at roughly $27 bucks a bottle. Overall I think this is a great Canadian Whiskey and a respectable purchase for a novice just getting into whiskey due to it’s sweet taste and lower heat than higher proof Whiskeys sometimes bring to the table. I would suggest drinking Collingwood neat, it waters down quickly loosing some of the great flavors they worked so hard to achieve if anything is added. Color: Light amber, similar to honey. Nose: Sweet with subtle nuances of vanilla and caramel including a touch of fruit. Palate: Very vibrant with a great mix of classic whiskey flavors including maple syrup, butterscotch and molasses. Every sip seems to allow another flavor to appear. Finish: Medium length finish, warm with a bit of spice but still leaves a nice sweet flavor on the tongue.